While there are countless platforms for listening back to music performed by original artists, there are far fewer that let viewers easily find cover versions of their favorite tracks, which is where Covr steps in. 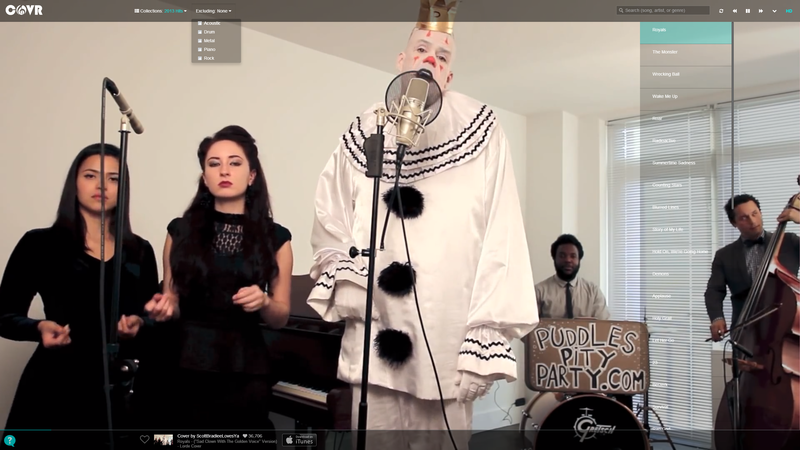 Simply put, Covr is a Web platform for listening to and discovering music videos by cover artists. The videos are largely sourced from YouTube, the company told TNW, but an algorithm is used to weed out videos that are tagged as parodies, tutorials or comedic in essence to try and keep the videos relevant. There are several pre-populated playlists ready to go in the Collections area – currently listed as Christmas Covers, X Factor, Hit Song Covers, Music Genres, Instruments, Musical Covers, Disney, Game Covers and Anime Covers – from which a sub-category can be selected. For example, selecting Disney brings up options like The Lion King, Beauty and the Beast, Aladdin etc. Selecting one of those then returns covers of the tracks from that movie. Alternatively, you can enter any search term and it will return a playlist of covers matching that – or so the theory goes. In our own testing, there are obviously still a few kinks to be worked out with the algorithm, as searching for a word like ‘Frasier’ returns results by the cover artist Walt Frasier, as well as a few full TV episodes of the show Frasier. Once you’re listening to a playlist (Collection), you can use the drop-down controls to fine-tune and exclude certain types of cover, like rock or piano versions of the track. Despite the slightly inaccurate results that are sometimes returned and the less than stellar home page design (the video player is better, thankfully), if you’re a fan of covers, Covr could be worth a look as there aren’t too many places dedicated to such things.